Shown is the - retrospective ! - installation of a base of repair to a sketch critical relying on correct proportions (Ima 1). The frame-work consists of a reference-line AB, a vertical line p, a line q appropriate to define C, and eventually D and E for further refinement. Note: A well conceived framework allows more effectively to concentrate on the artistic intent. The photography (fig 1) in addition contains a baseline (yellow) and connection lines (white) defining points of repair reflecting the position of two brushes. Fig 2 presents but the framework of the points of repair. A number of 4 to 10 points is mostly sufficient to begin a project, additional points can easily be created later. Important is to establish the points of repair with great care, as all associated errors will invariantly transmit further, eventually requiring extensive and time consuming corrections later. Fig 3 shows how the drawing should present after the points of repair are established, the visibility of the lines of construction being restricted to the areas of intersection. Fig 4 shows the positioning of the two brushes on the supposed drawing plane. Important to keep in mind, that the solely purpose of the method is to assure proper positioning and proportions to facilitate the expression of the artistic intent. The proposed framework of points of repair is shown in fig 2. The baseline (yellow) consists of a - not entirely horizontal - virtual line connecting the two lower exterior corners of the roof. The white lines allow to define two top corners of the roof and a spot on the lower part of the front corner of the house. The blue lines connect to the little house to the left. The resulting framework of points of repair - a total of nine - are shown in fig 3 including the connection lines being part of the picture. Fig 5 shows the final sketch completed in a rather free manner. 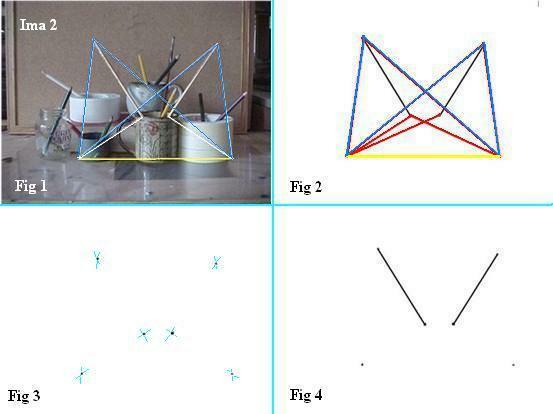 On first view it may appear that the established framework (fig 2) is pretty much at odds with anything qualifying as a base to build an artistic drawing upon. This impression is challenged when looking at fig 3, where instead of the lines of connection, lines being part of the picture are drawn, allowing then to complete the image with a few pencil lines (fig 4). As mentioned above, the visibility of the framework of repair should be restricted to the area of intersection, thus the connection lines need not to be established to the full extent. And also as already pointed out, that the only reason to use these procedures is to establish a framework of points of repair to assure proper positioning of lines and crossing-points, that this method is purely technical in nature, without intrinsic artistic value in itself. Having become familiar with how to proceed, will quickly allow to realize, that the selection of a baseline and the number of points of repair to be established depends much on the artistic intent and the means involved for its achievement.